GET YOUR NEW WEBSITE TODAY ! 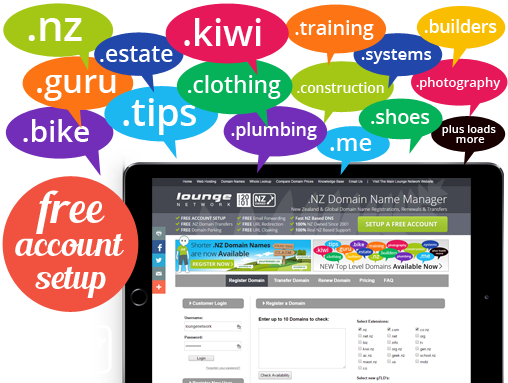 The Lounge Network is NZ’s Premier Domain Name Provider, for registering and managing .NZ Domain Names. We provide all our clients with full control over their Domain Name via our NZ developed Domain Manager system. Sign up to your own FREE Domain Manager account today, to begin registering new domains or transfer existing domains across. Transfer of .NZ domains is FREE and INSTANT. 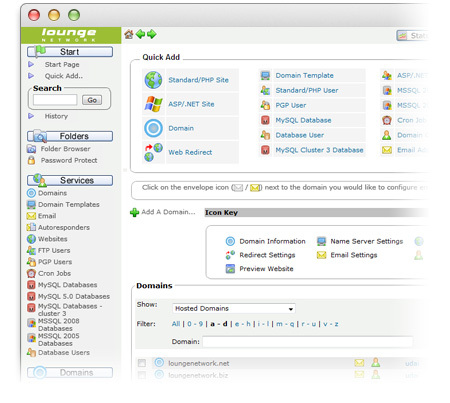 The Lounge Network provides all Premium Business Web Hosting Clients, with Email using the following technologies, POP, IMAP, SMTP and Webmail. These are all hosted on dedicated New Zealand based email servers. We also provide the Commercial ‘Atmail’ webmail platform to all clients on our Premium Business Web Hosting Plans. 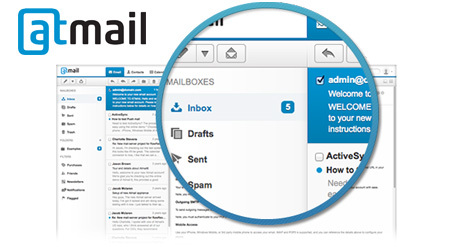 Atmail provides a beautiful clean interface, and lots of features which makes it one of the best Webmail systems. Our Premium Web Hosting Plans are 100% New Zealand based hosting. Not only are the servers based in New Zealand, but so are our staff, offering genuine NZ based support. This means that if you email us, you will get a reply from a real person based in New Zealand. Being 100% Kiwi means that we are supporting the NZ Economy, and profits remain in NZ to be reinvested back into the economy. The Lounge Network has been providing High-End Business Web Hosting & Domain Registration services since 2001. Our Premium Business Hosting Plan provides both Business Quality Web Hosting Disk Space and Traffic, on a Genuine New Zealand Based server network. 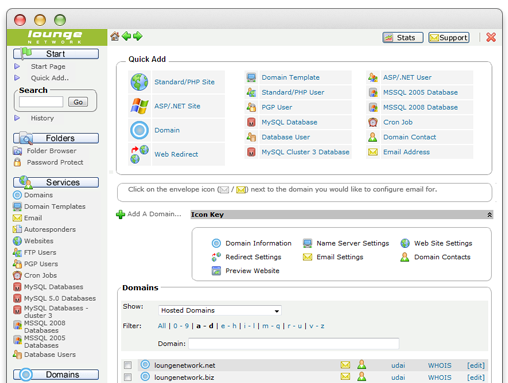 The Control Panel has also been designed here in NZ, allowing easy management of web hosting, email, and domain names in a unified control panel. Our Premium Business NZ Web Host Plan is industry leading, ‘Business Grade’ web hosting. It’s the first choice of web hosting service for many Web Designers throughout New Zealand. With our Premium Business NZ Web Host Plan, your websites are hosted on a New Zealand based redundant cluster that can grow on demand, and has multiple layers of redundancy. All this means your website is faster and more reliable. 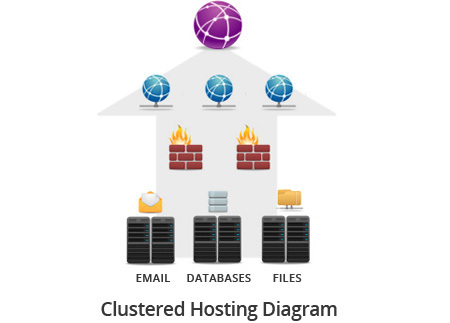 Cluster Hosting means your website files, databases, and emails are all stored on different servers. This means if one server fails, not all services will be affected. This is unlike ‘Budget’ web hosting providers running Plesk or Direct Admin, running just a single server and only limited backup’s. In the case of a budget host, if their single server fails, all services could potentially fail. The Lounge Network provides all Premium Business Web Hosting clients with Email hosted on dedicated New Zealand based email servers. Our email services utilise the following email technologies, POP, IMAP, SMTP and Webmail. For webmail, we also provide the commercial ‘Atmail’ webmail platform for our Premium Business web hosting clients. 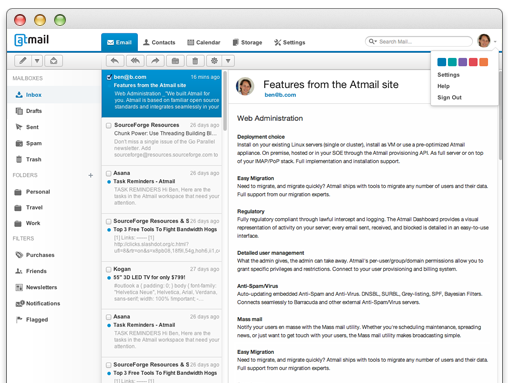 Atmail provides a beautiful clean interface, and lots of features which makes it one of the best webmail systems out there. Our Web Hosting is compatible with most of the popular Open-source Content Management Systems (CMS) and web applications. This includes powerful CMS’s such as WordPress, Joomla, Silverstripe, Drupal 7, and Concrete 5 to name but a few. 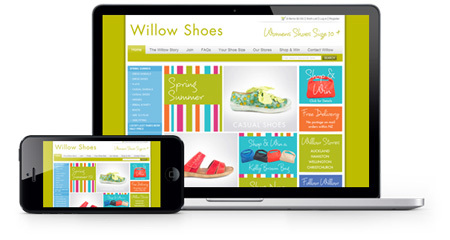 It also supports powerful E-commerce systems such as Prestashop, Opencart, OS Commerce. It should also support most other CMS’s and E-commerce platforms that support LAMP hosting, using PHP and MySQL. New versions of CMS’s are being released all the time, so please check the system requirements of your chosen platform and version, that they will be compatible with our server specs. Through our Web Design Division, Design Lounge, we can design you a spectacular looking modern website, using the most cutting edge web technologies. You only need to go as far as this website, for a live example of our web design skills. 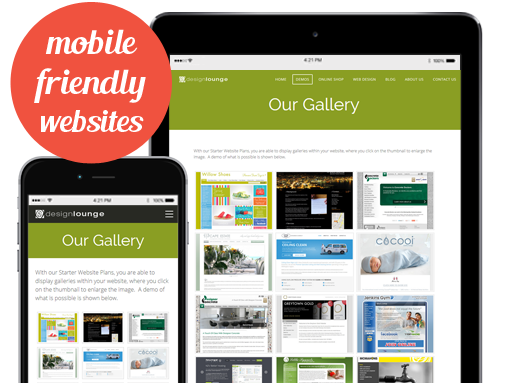 Most new websites are now also designed to be ‘Responsive‘ so their formatting auto adapts to mobile web browsers. Responsive design you only have a single website, rather than duplicating it for a mobile sized one. The Lounge Network are big supporters of all things ‘tech’, and believe we are all kids at heart, no matter what age we are. So we have put together the best quality technology gadgets and toys, and other things that we think Kiwis would be interested in, in our Big Kids Toy Shop. 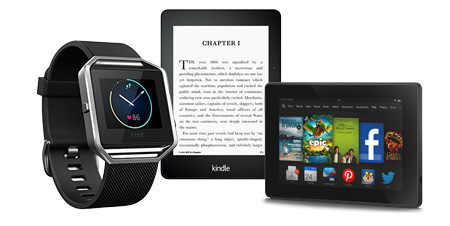 These include items such as Kindle NZ, Amazon Fire Tablet NZ, Amazon Fire TV NZ, Amazon Echo NZ, Fitbit NZ, Lego NZ, Casio Watches NZ, plus loads more. From our Big Kid Toy Shop pages, we have direct links to the manufacturers/supplier website for purchase. Most goods will either ship directly to New Zealand, or you can get them shipped to NZ using the NZ Post Your Shop service. I just wanted to say that the support you all provide is great and highly appreciated. I would just like to thank you for the very fast setup of my hosting account. You guys provide an excellent level of personal customer service, that I have rarely experienced with an IT company. My web site is the third web site I have had for various businesses and I am very impressed with the hosting services offered by you guys. We have had such a huge response to our website…..everyone has responded that the site is very professional, beautifully set-out and easy to use. Are you ready to host your website with the Lounge Network?